: The ever sarcastic Nick Gautier has bigger things to worry about than fitting in at his prestigious high school. He’s caught the attention of the Dark-Hunters, a group dedicated to ridding the world of evil, not to mention that the majority of Nick’s classmates have been turning into zombies. Now, on top of worrying about his overworked, single mother, Nick is indebted to Kyrian, a powerful Dark-Hunter, and has taken on the task of restoring the zombies to their former state. He just needs to do all of this before curfew. Lee was actually the one who recommended this lovely book to me. She thought I would like it, especially with all the zombies and sarcastic remarks. I did enjoy the book, and I definitely appreciated the sarcasm. The characters in this book were great. Nick was so sassy, it killed me! I felt bad about his living situation, and I was peeved, though a little intrigued, by his deadbeat, criminal father. Nick manages to do pretty all right for himself. He has a good circle of friends. Kyrian was the “cool” guy. He swooped in and saved the day, all while keeping his mysterious bubble intact. Although I usually go for those types of guys, he was a little too angsty for my liking. The two guys who really put the cherry on the book for me were Bubba and Mark. Man, those guys are awesome! Not only were they uber smart, tech savvy, and amusing, but they were also the best zombie slayers around! I loved their whole best friends forever type of atmosphere! They and Simi, the barbecue addicted demon, made the book a lot more amusing to read. The book itself was an easy read. It wasn’t the type of book that required your brain to be functioning at one hundred percent. 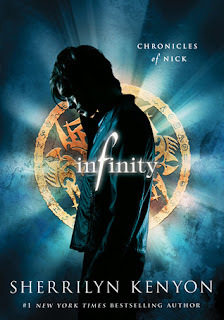 I don’t think I understood or appreciated Infinity as much as I could have. I haven’t read Sherrilyn Kenyon's adult Dark-Hunter series, nor am I, being a teenager who shies away from “steamy” situations (though Lee doesn’t seem to have a problem with ‘em). My reluctance to read the adult series does not help me in the “loving this series” corner, especially since I think that Chronicles of Nick is more of a spin-off anyway. I think reading the adult books would have been beneficial; then I would have had the whole backstory and information up front and center. Aside from being slightly unprepared, I had a lot of fun reading this book. It was light and humorous. Plus, the characters were great! Although the zombie plotline wasn’t the meat and potatoes of the story for me (the whole Dark-Hunter thing was), I was still quite fascinated with it. I’m glad Lee got me to read this. Infinity was a light, fun read. Those who have read the adult series should definitely check it out, and those who haven’t should still check it out. Yeah, I wish Bubba and Mark were my best friends! Nick's mom is pretty cool, she really cares about her kid. It would be interesting to learn more about her. Me too! They make the book a lot more fun. Glad you enjoyed the book and awesome review! Okay, my comment is all screwed up lol! I love Nick's attitude too! That's good that you've tried the adult series, I might take a chance at it in a couple of years.